← What will you say to Allah? 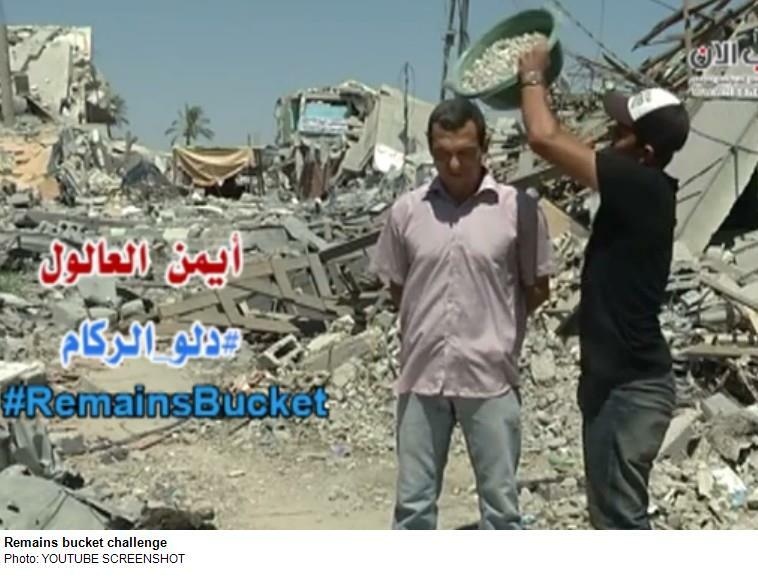 A new trend in support of Gaza is going viral across Arab social media, after a Palestinian journalist filmed himself dumping a bucket of sand and rubble over his head, in an activity he dubbed the “Remains Bucket” challenge. The challenge imitates the popular Ice Bucket challenge,in which people photograph themselves pouring a bucket of ice water over their heads, to promote awareness of the disease amyotrophic lateral sclerosis. Palestinian journalist Ayman Aloul started the trend with a video posted to his YouTube channel on Saturday. “I liked the idea of the ice bucket challenge, so I decided to invent the Palestinian version,” Aloul says, as he stands amid the rubble of a bombed out building in Gaza. Aloul says that the Remains Bucket challenge is a way of showing empathy for Gazans affected by Operation Protective Edge, by enabling those who take the challenge to show they understand the children’s suffering. Explaining why he chose rubble instead of water, Aloul said that water is a scarce resource in Gaza, and would be difficult to freeze. Pointing to the rubble, he said he decided to use that for the Palestinian version of the challenge, instead of water. The trend quickly caught on in, and beyond, Gaza. Among those taking the challenge include Jordanian comedian Mohammed Darwaza, who said it enabled him to feel the pain felt by children in Gaza. Turkish pro-Palestinian NGO IHH posted a video of a Gazan man and four children undertaking the challenge. If you see goodness from me, then that goodness is from The Creator. You should be thankful to The Creator for all of that. Cause I'm not the architect of that. I'm only the...the recipient. If you see weakness or shortcoming in me it's from my own weakness or shortcoming. And I ask The Creator and the people to forgive me for that. _______________________________ Website eigenaar voor een betere wereld en doel, niet gericht op verdiensten van geld maar goede daden. In de naam van Allah, de Barmhartige. Als je goedheid van mij ziet, dan is dat de goedheid van de Schepper (God). Wees De Schepper dankbaar voor dat. Want ik ben daar niet de architect van, ik ben alleen de ontvanger. Posted on August 25, 2014, in NEWS and tagged activity, arab, arab social media, awareness, ayman aloul, bucket, challenge, channel, gaza, goes, joanna paraszczuk, Jordan, journalist, jpost, Morocco, news, palestine, palestinians, popular, pro, pro gaza, promote, remains, remains bucket, rubble, rubble bucket challenge, social media, source, support, support of gaza, trend, upload, video, videos, viral, YouTube. Bookmark the permalink. Leave a comment.